Buzz Aldrin, the second person to set foot on the moon during humanity's first lunar landing, has launched on a nationwide book tour to promote his "Mission to Mars." The Apollo 11 moonwalker outlines his case for launching humans to the Red Planet by 2035 in "Mission to Mars: My Vision for Space Exploration," released Tuesday (May 7) by National Geographic Books. Ultimately, Buzz Aldrin proposes establishing a permanent U.S.-led human presence on Mars 66 years after the first moon landing — the same amount of time that passed between the Wright brothers' first powered flight and he and Neil Armstrong touching down at Tranquility Base. To further his vision and promote the book, Aldrin, 83, has embarked on a coast-to-coast (and back again) tour, kicking off Tuesday in New York City. His first "Mission to Mars" book signing was at a Barnes & Noble in Manhattan. Aldrin will then travel to Washington, D.C., where he will meet up with his co-author David for back-to-back evening presentations at National Geographic's museum. While in the nation's capital, Aldrin will also speak at the "Humans2Mars Summit" being held at George Washington University and discuss the book during a Friday (May 10) event at the National Press Club. Aldrin will then rocket back to the Big Apple, where he will be interviewed by adventurer and journalist Jim Clash as part of The Explorers Club's "Exploring Legends" series. While in New York, Aldrin will also drop by the Cradle of Aviation Museum in Garden City, near where the "Eagle," the lunar module he and Armstrong landed on the moon, was built. Returning to his current home city of Los Angeles, Aldrin will speak at the annual awards dinner for the American Institute of Aeronautics and Astronautics (AIAA) on May 15. He is then scheduled to sign books at the San Diego Air and Space Museum and speak at the National Space Society's International Space Development Conference at the nearby Hyatt Regency La Jolla. Crossing the United States again, Aldrin will land on June 1 at the National Air and Space Museum in Washington, D.C. for a public book signing and then participate in "The Future is Here," a Smithsonian conference to be held at the National Museum of the American Indian that same day. Aldrin will visit his hometown on June 2, speaking at the Montclair Public Library in New Jersey. The talk and book signing will then lead into a trio of visits to the presidential libraries of Ronald Reagan and Richard Nixon in California and the William J. Clinton Presidential Center in Arkansas. The book tour, which includes other stops at bookstores and expos, as well as media appearances including BBC America's "The Nerdist" and Discovery Channel's "The Big Brain Theory," stretches through the summer. "Mission to Mars" is Aldrin's eighth book. He has also written three autobiographies, two science fiction novels and two books for children. Aldrin will autograph copies of the latter, titled "Reaching for the Moon" (Harper Collins, 2005) and "Look to the Stars" (Putnam, 2009) during his current tour, but will sign no other books or memorabilia, according to his website. For those who cannot attend the scheduled book signings, National Geographic Books is hosting a sweepstakes on Facebook to give away autographed copies of "Mission To Mars," as well as "Destination Mars" maps. The contest is open to U.S. citizens only now through May 31. 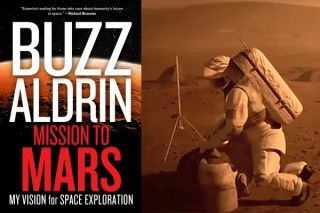 For more about these events, as well as an up-to-date list of where Buzz Aldrin will be signing copies of "Mission to Mars," see collectSPACE.com's astronaut and cosmonaut appearance calendar.